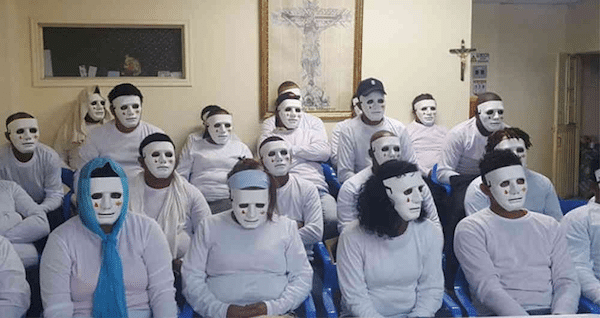 Just a week ago, Colombian social leaders—denouncing the murder of another comrade—showed up to a press conference with masks covering their faces. They did so in order to avoid risking their own lives: such is the danger of defending human rights in Colombia. But a few days ago, the country’s Minister of Defense, Luis Carlos Villegas, decided to publicly deny the fact that hundreds are losing their lives—and chose to do so in the most insulting terms. In an interview with Colombian news outlet Noticias Uno, Villegas said that the vast majority of violent deaths of social leaders registered in Colombia was explained by personal conflicts like “fights [between neighbors] over fence placing, over women, over pride, or over illicit business”. Besides, he affirmed that “half of the murders have judicial explanation, and there’s no organization behind them”—diminishing the importance of organized persecution against social and political leaders. Social leaders of the Bajo Atrato Choacano and Urabá of Antioquia denounced the persecutions, threats and selective murders they are exposed to in a press conference in Bogotá last December 14. There is more than enough evidence to prove that most murders are linked to the usurpation of peasant lands by big businesses, to the harassment of paramilitary groups to communities, and the attempts to stop the implementation of the peace agreements. The UN has established that the assassination of social leaders is systematic in Colombia, although it only recognized 64 murder reports made by the Ombudsman’s Office and the standardized denouncements made in the Prosecutor’s Office, while Colombian human rights organizations denounce a total of 117 political murders for the same period. Even President Juan Manuel Santos, who had always denied the issue, publicly acknowledged it last November. The pattern of these assassinations is consistent with political murders due to the roles the victims had as social leaders and their vicinity with areas where there is social conflict. But to the Minister of Defense, this is merely a coincidence. After Villegas’ declarations, the organization Victims of Bajo Atrato demanded the renunciation of the Minister or his expulsion by the President. The organization defends victims of political crimes in Bajo Atrato, Chocó, where in less than 10 days, two social leaders were murdered: Mario Castaño and Hernán Bedoya. A member of Victims of Bajo Atrato, whose identity is reserved, said the Minister’s declarations “mocked the deceased” and “are a revictimization of people who have lost their lives for a cause”.